Sketchbook_November 24, 2009_9, originally uploaded by Brin d’Acier. Pasila train station in Helsinki. In the past I’ve mainly drawn architectural details that captivated me by their beauty. Lately I’ve started seen subjects in the banality of industrial details. 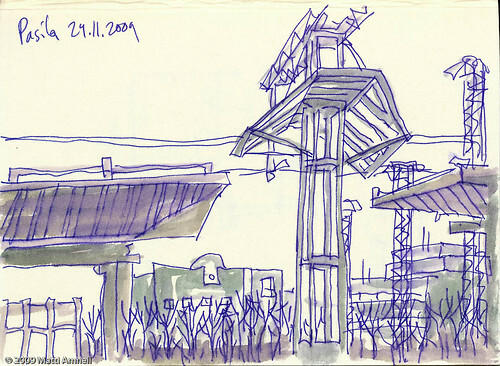 This entry was posted in Sketch of the day, Sketchbook and tagged finland, helsinki, ink. Bookmark the permalink. J’aime beaucoup tes paysages urbains croqué en passant le temps ou en attendant le train! Autant les vieilles gares son remplie du romantisme du départ, les nouvelles expriment surtout la mélancolie du ‘nulle-part’.